This month, the U.K. organization currently assessing whether to update the clinical guidelines for the illness it calls CFS/ME is seeking input from “stakeholders” in the process. Unfortunately, that’s not good news—it’s bad news. Why? The National Institute for Health and Care Excellence, or NICE, is an independent body that operates under the sponsorship of the U.K. Department of Health and establishes guidelines for clinical practice. NICE created its current guidelines for CFS/ME, called CG53, in 2007. These were heavily influenced by the cognitive behavior therapy/graded exercise therapy (CBT/GET) paradigm, which was already dominant in Britain before the first PACE results were reported in The Lancet in 2011. NICE is in the process of reviewing whether it should take a fresh look and update CG53. The guidelines cover a range of areas, including clinical presentation and diagnosis as well as management strategies. The organization has asked those who have registered as stakeholders, such as advocacy groups, to submit comments between July 10th and July 24th. But in a recent exchange of e-mails with NICE, the ME Association clarified that the request for stakeholder input means the organization has already reached a preliminary decision that no revisions to the 2007 guidelines are necessary at this time. The two-week comment period therefore offers, at best, a formal opportunity to change the minds of people who have already indicated that their minds are made up. Since the available evidence has not yet persuaded them that recent events have rendered obsolete the old recommendations for CBT and GET, stakeholders have an enormous challenge in seeking to effect any change in their perspective. The NICE solicitation of input from stakeholders comes right as the U.S. Centers for Disease Control has suddenly stopped recommending CBT and GET for what it calls ME/CFS. In early July, mention of the two treatments vanished from the CDC website. The website still suffers from multiple issues; the agency says more changes are forthcoming. But the removal itself should signal to NICE that the tide has shifted against both the CBT/GET ideology and the science purportedly proving that these treatments are effective. A decision to ratify the current NICE guidelines, as if nothing has changed since they were promulgated, will be greeted with dismay from many in the international scientific community. Some have argued that it is better to be able to provide patients with some recommendations rather than none. It is therefore important to stress that a recommendation should not be kept just because there are no better recommendations to make. If a recommendation is based on results from studies that promote bias, or on results that have been inflated through outcome-switching or have been derived from heterogeneous samples or are inaccurate for other reasons, then the recommendation needs to be rescinded, even if there is not sufficient current evidence to suggest other proven treatment approaches. That is especially the case when patient surveys and biomedical evidence raise concerns that a recommended strategy—in this instance, a steady increase in activity levels–is causing serious harm rather than benefit. The fact that NICE decided to reconsider the 2007 guidelines this year seemed like a potentially promising development, but it was unclear what new information the agency would consider. For example, would the surveillance review include only reports from clinical trials of therapeutic interventions? Or would it also include findings of physiological abnormalities, most from research produced outside the U.K., which undermine the deconditioning theory that supports use of CBT and GET? Other questions: Would the review consider the conclusion of the 2015 report from the U.S. Institute of Medicine (now the Academy of Medicine) that “exertion intolerance” was a cardinal symptom, which raises questions about whether GET is contra-indicated? Would it consider that the U.S. Agency for Healthcare Research and Quality found little or no evidence for CBT and GET after removing Oxford criteria studies from its analyses? And would it include the reanalyses of the reported PACE “recovery” and “improvement” findings, which were dramatically boosted by post-hoc outcome changes? The consultation document also notes that only study abstracts, not the studies themselves, were reviewed. This is a surprising methodological choice given the significance of the issue. Abstracts can be seriously misleading and incomplete; studies themselves obviously provide a much more authoritative and nuanced picture. It does not seem too much to expect that those responsible for establishing enormously influential clinical guidelines should have taken the time to examine the actual research on which they were basing their recommendations. To learn that they did not is rather shocking. In response to the controversy over the PACE trial, the document notes more than once that the investigators themselves have responded to criticisms, citing the FAQ on the trial website and other publications. The surveillance team appears to accept these responses at face value–as thorough and honest explanations. Perhaps no one has examined them closely enough to realize how empty and full of half-truths they are. The PACE investigators have certainly tried to defend their work. But there are no reasonable answers to many of the concerns, so their responses to date have only satisfied their ideological companions and those who know little about the debate. The consultation document contains some troubling inaccuracies in its discussion of the PACE trial. For example, it reports that “the PACE authors note that…changed thresholds for recovery were pre-specified.” But it is simply false to call the revised thresholds “pre-specified.” The recovery thresholds for physical function and fatigue—two of the four recovery criteria in the 2013 paper published in Psychological Medicine–were the same as the “normal range” thresholds included in the 2011 Lancet paper. In that earlier paper, these thresholds were presented as part of post-hoc analyses, so it is hard to understand how the same thresholds could also be “pre-specified” under any standard definition of the term. Besides that, all four recovery criteria were weakened, so it was self-evident that each change, whether pre-specified or not, would boost the numbers that the investigators could report had achieved “recovery.” Moreover, the 2013 paper does not cite any oversight committee approval for the major changes to the “recovery” definition–an oversight that should have raised alarm bells for Psychological Medicine. (Since the NICE surveillance team only reviewed abstracts and not actual papers, it would not have noticed this unusual lack of oversight committee approval.) And the consultation document fails to mention the fact that 13 percent of the PACE participants were already “recovered” for physical function at entry—an anomaly that should have prevented publication. In another inaccurate (or at least highly disingenuous) statement, the consultation document notes that the investigators “have re-analysed the main outcome measures according to the original protocol with similar results to those in the primary PACE results paper i.e. reduced fatigue and increased physical function.” But it is stretching the truth beyond recognition to claim that the results of the reanalysis were “similar.” In the 2011 Lancet paper, the investigators reported that around 60 percent “improved” with CBT and GET; in the 2016 reanalysis, which used the original PACE protocol’s definition of “improvement,” the figure fell to around 20 percent. Proponents of PACE have cited the 60 percent improvement rate as evidence of the effectiveness of CBT and GET. So a two-thirds decline in improvement rates should change any reasonable observer’s assessment of the effectiveness of the interventions. For NICE to accept the PACE investigators’ argument that this dramatic drop represents “similar results”–presumably because they were still able to report some very modest “improvement”–suggests that the surveillance team and topic experts are assessing the data with preformed opinions. Hm. So they used these studies the first time around ten years ago, and therefore it must be okay to use them again; something about that logic escapes me. And the topic experts expressed “no concerns,” shrugging off the case definition problem because there is “no gold standard.” But this thorny issue is at the core of the current controversy, and failure to address it is not a viable option. Scientists outside the influence of the CBT/GET ideological brigades understand very well that the populations generated with the Oxford criteria cannot yield actionable findings about an illness that should be defined much more specifically. The consultation document also states that NICE will encourage Cochrane to update a 2008 review of CBT so that it can include the reported results from the PACE trial. “A further review of the guideline may be considered following publication of the updated Cochrane review,” stated the document. In other words, the NICE surveillance team is not only not deterred from considering the PACE results but is taking steps that would amplify their impact on the recommendations. “As stakeholders, the ME Association believes that the current guideline is not fit for purpose and that we are not being afforded a fair opportunity to help produce a better version. The petition’s specific demands include, among others, a “complete and proper review” of the current guidelines, recognition of CFS/ME as a neurological disease in accordance with UK health agencies, removal of the GET recommendation in particular, and the highlighting of pacing as a strategy widely used by patients. The ME Association petition has so far collected more than 11,600 signatures. NICE will presumably consider the stakeholder input before making its final decision. I guess the topic experts will also be given another chance to weigh in. I hope there’s a real chance to change the outcome. I sent the CDC a few questions last week after the agency had removed CBT and GET from its web pages, among other changes. I wanted to know what had prompted the changes, whether the removal of CBT and GET constituted an acknowledgement that there was no reliable evidence to support recommending the therapies, and whether the agency would apologize for having gotten it wrong. I also asked if the CDC would actively disseminate information about the changes. Thank you for your interest in CDC’s recently updated ME/CFS web pages. In follow-up to the IOM report, CDC hosted a roundtable meeting with a variety of stakeholders including ME/CFS patients, advocates, clinicians with ME/CFS expertise, healthcare professional organizations, medical educators, researchers/foundations, and other government agencies. The goal of this face-to-face meeting was to provide an opportunity for individuals to share their thoughts about how the IOM report could best be communicated through the CDC ME/CFS website and our educational materials for a variety of audiences. During the website revision process, our staff focused on conveying information in plain language that would be understandable to the general public, regardless of the viewer’s background knowledge of ME/CFS. Part of this process included removing jargon and medical terms that we know are not widely understood by the general public and could be confusing. As you will see on the website’s “treatment” tab, we suggest that patients with ME/CFS be careful about how they incorporate exercise into their lives. Every person’s experience with ME/CFS is unique so we continue to recommend that patients and their loved ones work closely with their doctor to determine the best course of management for themselves. We continue to believe that exercise can be useful for some ME/CFS patients, and also are trying to emphasize that people need to be careful not to overdo it and push themselves so far that it harms their health. We also state that talking to a therapist to help find strategies to cope with their illness may be helpful. We know from our past discussions with patients and their loved ones that there has been confusion about what we recommend related to exercise and therapy. We hope that the updated website provides more clarity. CDC staff are currently developing the web pages for healthcare professionals. We plan to use social media and established partner communications channels to ensure that the general public and healthcare providers are aware of the new site once the healthcare pages are completed. In addition, we are collaborating with the CFSAC education workgroup on ways to disseminate information about ME/CFS to medical professionals and the general public. Thanks again for your continued interest in this important public health topic. This is nonsense. Patients and advocates did not complain about the CDC website because they didn’t understand what it was recommending. They complained because it specifically recommended GET and CBT, citing PACE. After removing references to PACE from the website, the agency then claimed that CBT and GET were generic management strategies, unrelated to PACE. This claim was untrue. What other illness is GET recommended for? In what other illness is CBT supposed to alleviate you of the misguided belief that you have the illness in the first place? Until early July, that is where things stood. Now the CDC seems to want to pretend it was all a big misunderstanding. To be clear: Patients are not against activity or exercise per se. They recognize that people with the illness should move their bodies to the extent they can without over-exerting themselves; that is a basic concept behind the self-management strategy called pacing. It is the “graded” aspect that patients find alarming—the idea that activity levels need to be steadily increased to reverse the deconditioning that is wrongly hypothesized as causing the symptoms. Similarly, patients are not against psychotherapy as a tool for coping with the demands and stresses they confront. They are against the specific form of CBT that has been created to treat their illness. So patients were never confused by what the CDC’s recommendations meant. They understood that the recommendations meant the CDC bought into the CBT/GET paradigm, despite the PACE trial’s glaring flaws. In maintaining that it made the changes to prevent “confusion,” the CDC is weaseling out of admitting the obvious–the country’s top public health officials got this one wrong for years. The PACE trial–the crown jewel of CBT/GET research–has been authoritatively discredited. But the CDC won’t say so. CBT and GET have been the de facto standards of care for this illness in the U.S. A major reason is that the CDC endorsed the therapies. Now the agency has abruptly un-endorsed them. That’s a big, big deal, not a minor tweak. For the sake of public health awareness and understanding, CDC officials have an obligation to provide a direct, transparent, and credible account of why they made these major changes. The statement I received from them does not demonstrate those qualities. The consultation document indicates that the surveillance team and topic experts did in fact take notice of the recent controversies and the new literature, including the reanalyses, before concluding that the guidelines should remain the same. Does this expert team understand the implications? PACE was justified on the basis that the evidence base was ambiguous. The re-analysis showed that CBT/GET don’t lead to recovery and that the self reported improvement is modest and could be fully explained by the lack of blinding. The vigorous debate on the methodological weaknesses of PACE are also relevant to the rest of the CBT/GET literature. One can’t help but suspect that these experts are in some way involved in the CBT/GET business. The document noted that some upcoming research could impact the guidelines down the line, and identified specifically a study of online CBT for kids—an apparent reference to FITNET-NHS. Amazing, thank you for this. Great explanation. Another excellent analysis. Thank you. I do ponder at what point NICE becomes responsible for ‘harms’ as a result of its guideline? Regarding the Ritux trial results, while these will be important, Fluge & Mella have confirmed that the results won’t be published until sometime Spring 2018, so too late to influence NICE this time around unless NICE would postpone their decision, something that is most unlikely. The biggest absurdity is that NICE pretty much requires the presence of PEM (Post-Exertional Malaise) to diagnose ME/CFS, while relying on non-PEM fatigue studies to recommend treatments for it. We might quibble about different definitions, but PEM is consistently considered mandatory by most criteria, patients, researchers, and doctors. There’s simply no excuse for NICE to define a disease one way, then allow research into something else entirely to provide an evidence base for it. If NICE likes Oxford fatigue and refuses to let go of it, they need to separate it from ME, with a different definition and evidence base for each. Trying to have it both ways, as they currently do, is resulting in the wide scale neglect and abuse of patients. Excellent point. It’s a bit like studying postprandial hypoglycemia and then extrapolating from it to type 1 diabetes. Thank you David. Excellent as ever. The fact that NICE are considering including new results from FITNET shows that they have learned nothing from the criticisms of PACE. FITNET was promoted to the public before it started through a big media campaign in which the principal investigator told the public that this was a treatment that will help children with CFS get better. In other words she has taken an unblinded trial with subjective outcome measures (as with PACE) and before it even starts, made a public declaration of which treatment she expects to work. That is not science, it’s propaganda, and trying to influence the outcome of the trial so blatantly should automatically have stopped the trial before it started. I hope they won’t set off the spam alert… I had trouble with links before. Indeed, the only positive is that NICE proposes that the condition comes off the static list ‘because of FITNET’ (*facepalm*). That means a review in two years which would be after the release of the RituxME results. I think NICE and the UK government have a bigger problem: PACE and the treatment of CFS/ME patients underpins their ethos to benefit claimaints – that being “work will set you free”… oh, I think they used “work promotes recovery”. Including the idea that removing payments from people gives them a better and firmer incentive to find another job, top up their hours or stop being lily-livered weaklings about their disabilities in order to be able to keep a roof over their head and to be able to eat. The new CDC page leaves a backdoor that allows doctors to continue prescribing CBT/GET. It needs to be made clear that these are not appropriate treatments for ME/CFS so that patients don’t waste their time on it and don’t risk deterioration. They may be appropriate for patients with the simpler idiopathic fatigue and no neurological abnormalities (ie. the Oxford criteria), but even that is in doubt given the poor quality of the relevant literature. Thank you David for explaining what the consultation process involves. It seems to be set up to maintain things exactly as they are whilst pretending they are considering change. What?! My old boss, a Professor, said he would never comment on a paper based on just the abstract. He would read carefully through the whole paper first. And yet this organisation who use the word ‘excellence’ when referring to their guidelines on which doctors and patients expect to be given the best possible advice, can’t even be bothered to examine the research in any detail. Jeez. We’re in trouble if that’s the case. I think the fact that the NICE Expert Group is so eagerly anticipating the FITNET results is a bit of a giveaway as to who those ‘experts’ were. To be ‘fair’, it is reasonably likely that some of them were involved with writing the papers, so would not need to read beyond the title to know about them in depth. This does of course have obvious issues. Thank you for another excellent post, David. The NICE guidelines don’t just affect UK patients. They affect every ME/CFS patient in the world because they influence and are cited by other government agencies when determining policy. The petition closes on 21 July. PLEASE sign it and share as widely as possible. I have been heartened by the number of healthy people who have signed it at my request (iat least 20 – including at least three UK doctors). Well done, David. The CDC’s response perhaps isn’t surprising given that bureaucracies unfortunately will almost never admit that they were wrong. They’ll instead chalk it all up to a ‘misunderstanding’ (in this case, blaming the patients again of course) and hope that all the scrutiny quietens down eventually. Why the retraction of the paper is so important, nothing less will perpetuate this insanity. Or fund new study well designed (using the pacific lab method). Measure Aerobic Threshold (AT) at the beginning of trial and at the end. Thank you David Tuller for an excellent article. This is such an epic public health failure and these guidelines have enforced abandonment. The psychosocial model is only being considered. Regardless of criteria, up to possibly 85% of people being diagnosed with ME/CFS do not respond to GET and CBT(Pace version), yet they are having this foisted on them when PACE authors themselves should be hoist by their own petard based on their own evidence – including the last two papers which were flops of efficacy. Since when it is ok to ever push “therapy” on anyone and make it a blanket prescription. What happens when a manipulated view is represented. What happens to the approx. possible 85% or more when these treatments fail them? Who do they think gets the blame when these fail? Patients get the blame and can also blame themselves, families blame them – as well as health professionals. What happens when families abandon loved ones because headlines in the media state graded exercise and changing beliefs will fix their family member?! They swim in a sea of no family, clinical or social supports while the disease remains. There is a complete absence of moral/medical codes of ethics and I think the ethics is the sickest part of all. NICE one! Since when is it ok to blanket prescribe and manipulate/misrepresent results (also in the media)continuously reinforcing the application of treatments that don’t work for the massive majority of people with ME/CFS and reinforcing stigmatisation clinically and socially. If patients refuse, that just reinforces the prevailing viewpoint held about people with ME/CFS. Will they ever understand the direct relationship between what they have done and their approach with how that makes patients vulnerable to abusive situations. I don’t know if we will have these issues along with multiple others in this area explained and documented in academic journals. God forbid they ever entertained the possibility that the PACE hypothesis could have been wrong – even more unlikely is the admission of it. to increase energy and decrease pain. Acupuncture isn’t a credible treatment for anything. The other things can probably increase quality of life in general, if the patient doesn’t have to sacrifice too many other important activities to find the energy for them. I’m skeptical they can really be viewed as effective treatments and I think there is the risk that the wrong message is sent to the public: “adopt a healthier lifestyle and you’ll feel better”. CFS was coined for immune abnormalities. There would have been no “CFS” syndrome without them. The goal of the CDC to get people to forget the real reasons and create a diversionary smokescreen that CFS was created to study ‘fatigue’ is built right into the name. 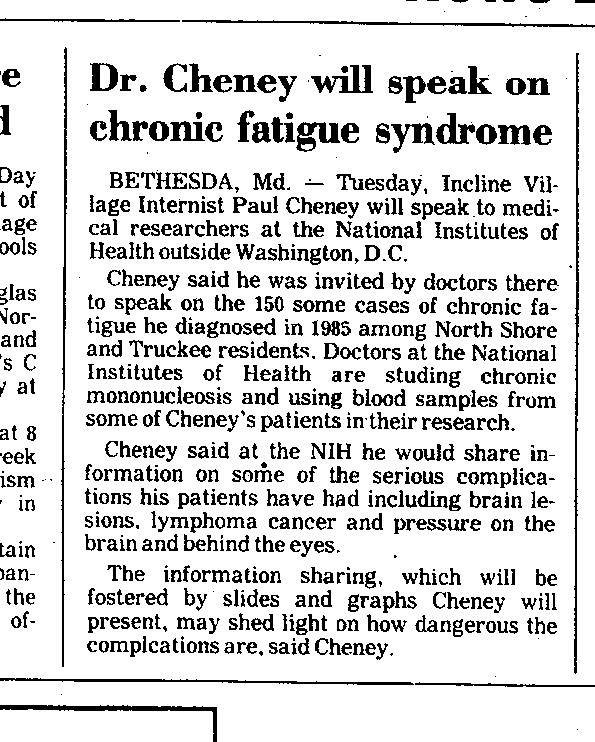 Dr. Cheney will speak on chronic fatigue syndrome. Thank you David, for another excellent article. The statement from the CDC is really very disappointing. And un-endorsing CBT and GET IS a big, big deal and not a minor tweak. Thank you for making that so clear and pointing that out! As you know the Netherlands are also waiting for new guidelines to come, as is Germany. I very much hope NICE will make the first step in the right direction after all. Thank you for all your support to make this happen. Kind regards from a ´Dutchie´ living in Germany. “If NICE likes Oxford fatigue and refuses to let go of it, they need to separate it from ME”. Surely this is the crux of the whole problem? NICE “likes” fatigue just a little bit too much – for my liking, anyway. Yes, that’s what they NEED to do. Why the devil DON’T they? NICE uses the bogus disease category of ‘CFS’ to impose a false psychiatric paradigm of M.E. by allying it with psychiatric fatigue states and various unrelated fatigue syndromes for the benefit of insurance companies and various other organisations and corporations which have a vested financial interest in how these patients are treated, including the government. This brings up the issue of whether anything at all conducted under “Oxford CFS” is valid. As anyone with common sense knows you can’t take a non psychiatric syndrome in one country and turn it into the opposite in another. Thank you for this honest, clear, concise reporting of this portion of governments’ appalling response to the global health crisis that is ME. Your summation of the neglect and betrayal patients have experienced is clearly set forth. No matter what outcome may come from this latest shenanigans of PACE and their supporters, I find the truth being put out there so clearly for all to see both validating and supportive. Little by little the bulwark they have set up around Pace is crumbling. You are a wonderful breath of fresh air, Dr. Tuller. Thank you very much again for this excellent article. Did they bother to review any of the biomedical evidence? There was a real uproar when the guidelines first came out back in 2007 as they ignored all the biomedical evidence which showed ME/CFS was organic, not wrong beliefs. The reason they gave for ignoring the evidence was that it wasn’t in their remit to look at the biomedical evidence, only to look at treatment research. Neat trick as the CBT/GET treatment papers also completely ignore the biomedical evidence,so if for example you look at PACE, no mention, no reference at all to the existence of any biomedical research but then they dare n’t mention it as that would invalidate the premise that it’s a behavioural disorder perpetuated by wrong illness beliefs. David Tuller, Thank you for making such in-depth reporting on these most important and confusing issues. I am grateful for your clear and useful reporting. This is another excellent piece of work from Dr David Tuller. David reports here that NICE, in seeking to justify their no-review decision, say that “… upcoming research could impact the guidelines down the line, and identified specifically a study of online CBT for kids—an apparent reference to FITNET-NHS.” As David says, “This study exemplifies some of the problems common in this field of research…” That is true, and they are fatal to the credibility of the “trial”, but there are is also a very serious problem that I have not yet see mentioned. As has been highlighted on a number of occasions, including a recent BBC radio programme (BBC Radio 4: File on 4, 21 June 2017), the parents of children with ME are being threatened with action under child protection legislation. The tendency to blame the patient, also widely reported, when treatments are unsuccessful compounds this problem. How can a trial be credible when parents and their patient-children are under such pressure to comply, and to report favourable results? That is not to mention that the trial is being conducted by persons who are so lacking in understanding or integrity, or both, that they go to disgraceful lengths in denying and disregarding the fatal flaws in their methods. These people will also apparently stop at nothing to try to discredit any criticism, despite the matter-of-fact standing of the criticism. How can any trial be credible when conducted by people that have behaved in these ways? Yet, NICE apparently rubber-stamps everything that these people say, without even looking at the pseudoresearch in question. This is another excellent piece of work by Dr David Tuller. We all owe him such a great debt. As has been highlighted on a number of occasions, including a recent BBC radio programme (BBC Radio 4: File on 4, 21 June 2017), the parents of children with ME are being threatened with action under child protection legislation. The tendency to blame the patient when treatments are unsuccessful compounds this problem. How can a trial be credible when parents and their patient-children are under such pressure to comply, and to report favourable results? So the apparent fact that “there is no gold standard definition” means that we should make no further effort to arrive at one. A signature Peter White fallacy. Not only that, but according to the logic of these people, the absence of a gold standard makes any old assumption a sound basis for official policy even when “research” intended to prove it has failed. Thank you for continuing to pursue this matter. NICE states that patients should be offered GET. NICE also claims these are guidelines and doctors are not mandated to follow them. However it is important to remember that in practice doctors, employers, insurers and the DWP would expect patients to take part in GET as a reasonable evidence based NICE sanctioned treatment action and are forced against their will to do so or face the negative consequences from refusing NICE recommended treatment. It appears they have set the situation up this way and both parties could claim they are not liable for the harms as NICE would claim it is a treatment option based on the best evidence but patients do not have to take part and the other individual doctors and entities could then claim they are following a reasonable body of medical opinion (NICE) and force patients to undertake CBT/GET. This is a serious matter as many of the problems with the (bio)psychosocial school and the PACE trial that you have documented are present within the NICE guidelines group. The same clique are interwoven in both of these issues. This is incredibly disappointing. Why is the CDC whispering, when bellowing is the only sound that CBT/GET adherents seem capable of hearing? I’m sure a clear statement about disendorsing GET would carry weight around the world, including here in Australia where practitioners still recommend it the “gold-standard treatment”. I also note that the sleep section on the CDC’s updated web pages says people with ME/CFS should implement the same sleep hygiene practices as others – including exercise! * abstracts of primary or secondary evidence that has been published since the end of the search period for the guideline, with critical appraisal of key papers. At each time point, decisions on the need to update a guideline are based on a cumulative assessment of the relevant research evidence published since guideline publication. As stated below, NICE are ‘not fit for purpose’; their inadequate process, has been/is being used by a BPS lobby group to advance their own ‘business’ model of illness, and actively promote treatments which are harmful to #PWME, and others. Evidence-based clinical guidelines .. I think NOT!